Our horses become a very special part of our lives. With the speeding up of time we are busy rushing here and there, looking for quick fixes and generally compounding any issue we have in our lives due to our own haste. When we start to look within and spend quality time with our horses, the insights we can learn from them can open up a new exploration of the world around us.One way to take time is to look at how we can work with our horses naturally. With domestication and our hectic routines our horses are close to losing touch with their ancient roots. We can reintroduce into their lives a selection of herbs and aromas from essential oils that will help all of us get back to a natural state of being. Herbs can be traced back to their use with several American Indian tribes and the Romani Gypsies of Europe. Both these cultures had accomplished horsemen and women who combined their training methods with the use of herbs. Even using herbs can be seen in the works of Xenophon in his book The Art of Horsemanship where is notes the importance of adding herbs to horses bran of an evening. The use of herbs for me conjures up a romantic image, of times gone by where we were more connected with the earth, and its cycles. When I read veterinary or stock care books from the 1880s their training methods were severe. I tend to wonder if it was because the natural products they relied upon in these texts contributed to the horses behaviour so severe handling was needed. The use of opium and cannabis-based products was high. Today the herbalists avoid herbs such as these or those that require a more than heroic effect to endure so one heals. The use of cathartic or purgative herbs is limited and rarely used with horses. We have gone back to the use of gentle herbs, when used wisely are unlikely to have adverse effects. These are quite often the herbs that you would find growing across paddocks or along roadsides. Where in the past horses that had free-range of a healthy grassed paddock could graze upon if the need arose. These days to get the benefit of herbs we need to supplement. You dont necessarily have to give your horse buckets full of herbs to get this benefit, often a combination of cut and sifted herbs can have an effect within the body in cupful doses. If the herbs are powdered you may not need to use more than two tablespoons to help the body heal itself. With many of our horses being stabled and not able to get out often due to our land restriction, essential oils can bring a touch of brain sunshine into their lives. Aromatherapy is a relatively new therapy. The use of essential oils can be documented throughout the ages, but its modern application is less than one hundred years. The beauty of aromatherapy is your horse can assist you with the selection of what he considers is most appropriate. Essentials have a special quality where they can act on the body when inhaled. Some of the constituents can then enter the bloodstream via the mucous membranes of the respiratory tract and the scent can be read by the olfactory receptors, which in turn has a cascade effect throughout the body. Emotions and memories can be accessed that have been stored within the limbic system and neurochemicals get releases through out the body to help instil a state of wellbeing. When using aromatherapy with your horse, you also gain the benefits from inhaling the essential oils that your horse selects while using them with him or her. That way if some of the emotional issues your horse needs to clear from his body belong to you, you are less likely to regenerated that particular tone and keep stocking him up with your imbalances. These therapies are useful in their own right, however when they are done with love and intention the increased effect can be ten-fold. 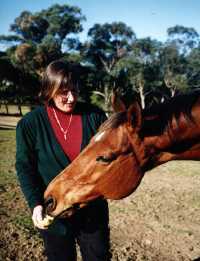 There is an energetic interaction between a horse and their human. The day to day working together sees an interesting mingling of energies. Over the years the original use of the horse to help us plough our fields, fight our wars, and even provide us with a meal has no longer been needed. However the genetic memory held in his body triggers him into being of service to us in some way. This unconditional love sees him often take on the energy of our illnesses or emotional and mental imbalances and if we are wise enough to spot when an issue is truly ours and take responsibility for it and address it, then our horse has served us and can heal. In a way when we take the time to help him with herbs and essential oils the act of caring for our horses with natural means completes the cycle. This does not mean that herbs and essential oils replace veterinarian care. They simply give the owner and the horse is more intimate way of relating and accessing a healing on a deeper level. I tend to prefer that veterinarian care be administered first to deal with what has developed in the physical body safely and with supervision. Then once the process has began then introduce the herbs and essential oils to facilitate healing on the mental and emotional levels so the physical manifestation is less likely to develop again.